I bought my Ryobi BT3100 table saw a couple of years ago for only $300 from Home Depot, and I've really enjoyed it. It's a bargain compared to most other so-called "hybrid" saws, and even cheaper than most contractor-grade saws, but has features that compare to saws in the $1000-1500 price range. With a 15A universal motor, it's only meant for occassional usage, not full-time use in a production shop, but as a garage woodworker that's all I need. 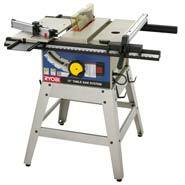 The saw is extremely smooth, and produces nearly glue-ready joints when ripping boards. This saw is extremely versatile, unlike most others I've seen that seem to be stuck with a more traditional design. There are two long aluminum rails on the front and the back, which can be repositioned in either direction to allow more capacity on either side of the blade. Attaching to these rails are two tables, which can be moved anywhere along these rails, on either side of the blade. The sliding miter table is the most useful; unlike most saws, this one does not come with a standard miter gauge, and instead uses a sliding table with a detachable miter fence. This allows for more accurate miter cuts, and much more support along the workpiece when doing such cuts. The biggest advantage is the enormous crosscut capacity, since the sliding table extends so far in front of the blade. On traditional saws, you're limited to the depth of the table before the blade starts, which is usually 12" or less, so to increase this capacity you have to build a "crosscut sled". The other table is mainly just for support, but it also includes holes for mounting a router. An additional router attachment kit provides a mounting plate and a fence attachment for use with a router. The BT3100 also has a very nice and effective fence, which locks down on both the front and rear rails. Lastly, the saw has very effective dust collection thanks to a blade shroud, and it also has a riving knife rather than a traditional splitter, making it a safer saw. There is a very active and useful website which caters to owners of this saw, and includes very active forums as well as plans for various modifications and jigs specifically for this tool. In woodworking, there just isn't that much use for a drill press overall. However, for those few times when you need a hole drilled accurately, they're indispensable. I picked up this Delta DP350 drill press on sale from my local Lowe's for around $125. Its biggest feature is variable-speed operation; on normal drill presses, you have to open the top and mess around with belts and pulleys to change the drill speed. But on this model, there's a simple lever on the front which changes the speed while the machine is in operation. For working with wood, however, you usually want a slow drill speed. 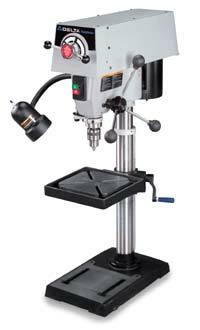 Otherwise, this machine has all the things you'd expect of a mid-size tabletop drill press: 12-inch span (6 inches between the drill bit and the main column, so it can reach the center of a 12-inch circle), depth gauge, light, etc. I think the biggest disadvantage of this drill press, for woodworking, is its 12" span. This makes it impossible to use sometimes for many large pieces of wood like you would use in furniture. However, this is a problem with most drill presses I think, since they're really designed for metalworking, not woodworking. Even the large floor-standing presses are usually only 14", which only affords you one extra inch between the bit and the column. I occassionally work with metals or plastics for my other hobbies, so of course this drill press will come in handy there as well. A random orbital sander is probably one of the most useful power tools you can have for woodworking. Sanding is always a tedious chore, but the ROS saves a lot of time and allows you to use a power tool for a lot of work that used to be done by hand. Belt sanders are good for very rough sanding where you need to remove a lot of material, but they're too clumsy for fine, finish sanding, and are easy to make serious mistakes with. The 1/4-sheet pad sanders don't have random orbital motion, so they leave noticable sanding marks with lower-grit paper. The ROS, by contrast, allows you to use lower-grit paper (for rougher sanding than the final finish sanding) to remove more material, but without leaving obvious patterns. I found the ROS most useful for the majority of sanding, from after the joinery is complete until near the end, when I go over everything by hand with a high-grit paper before finishing. With the Velcro pad on the sander, it's easy to change sandpaper grits, starting with 60 or 120, then moving to 220. 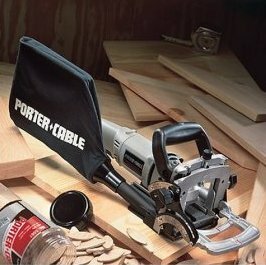 I use a Porter-Cable 333VS, which is a very popular ROS available for around $75. It uses a 5-inch pad, and has variable-speed operation which can be quite useful. A biscuit joiner is a tool that's only good for one thing, but it does that one thing extremely well. Biscuit joining is a European invention which simplifies joinery for situations where two parts must be kept at the same level. For instance, two boards glued together side-by-side in order to make a single, wider panel must be fastened together so that there's no significant offset between them. A biscuit joiner makes this task simple, because you can use the tool to cut slots in the two boards at exactly the same distance from the top, and then use "biscuits" (football-shaped inserts made from Beech wood) to fit the boards together. 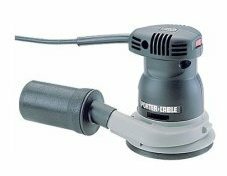 The biscuit joiner I picked is the Porter-Cable 557, which is a little more expensive than most of the competition, but has excellent quality and also several features not found in other models. In addition to great features such as having the top handle attached to the fence rather than the motor, and an excellent and accurate height-adjustment knob, one unique feature it has is that the fence can be set to 135 degrees, so that a biscuit can be set into the end of a board mitred to 45 degrees, using the fence to register from the outside side of the board. The other unique feature it has is that the blade can be replaced with a smaller blade (included) in order to use FF (face frame) size biscuits, a very small biscuit size meant for use in cabinet face frames.